It’s far from perfect but it is a great day for our small Pittsburgh Plumbing Business. We’ve Gone MOBILE. 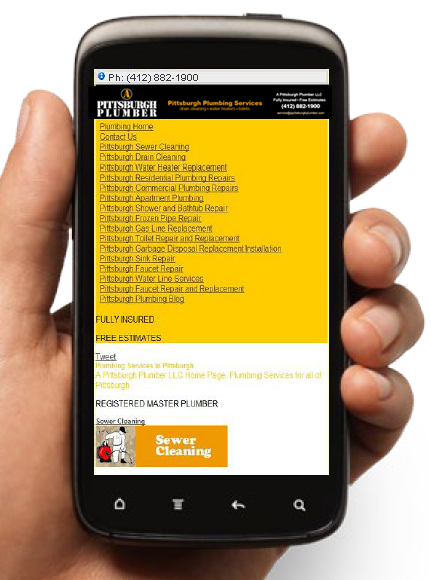 Now when a customer views our website from a mobile device they are automatically shown the mobile version – (view A Pittsburgh Plumber’s Mobile Site). We already have many upgrades in the works but one I would like to mention here is the click to call functionality of the mobile site. At the top of the mobile version of the A Pittsburgh Plumber mobile site is our phone number (412-341-7586) which you can select as a call link. This will allow prospective and long time customers to reach us with fewer headaches associated with trying to view our desktop website (.com version) on a mobile phone or pad. While I’m thinking about mobile marketing and social media I’d like to introduce you to our A Pittsburgh Plumber Facebook Page and A Pittsburgh Plumber Twitter Page as well. Please share our content and phone number (412) 341-7586 for that matter. We would really appreciate it.  As an added bonus you can look for our Plumbing Specials offered on our Facebook and Twitter Pages from time to time, so sign up to both of them and check in frequently. Speaking of signing in, Be on the lookout for our Foursquare Venue page coming soon. I’ll share more info with you as soon as it becomes available. Is there a product or service question you have? Would you like to see us include more How To video on our website? Help us improve by leaving a comment or suggestion and we promise to respond with our best efforts.